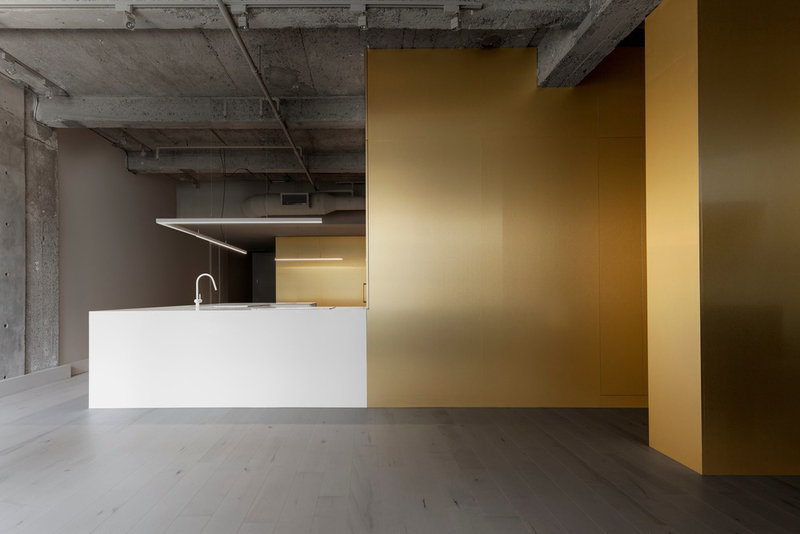 IN 3 Apartment in Montréal, Canada by Jean Verville architecte. It’s hard to know what to think about this project. It’s striking, that much is for certain. One cannot help but be captivated by the golden palette. Acres of walls clothed in a material suitable for an Emperor. 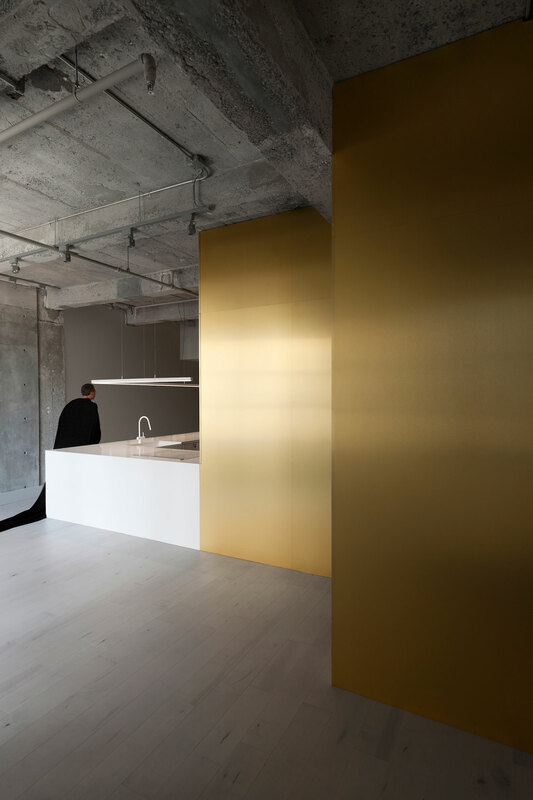 Its sheen is ever the more lustrous because it sits next to raw, exposed, concrete ceilings, pale timber flooring and a clinically white, almost aesthetically sterile kitchen. 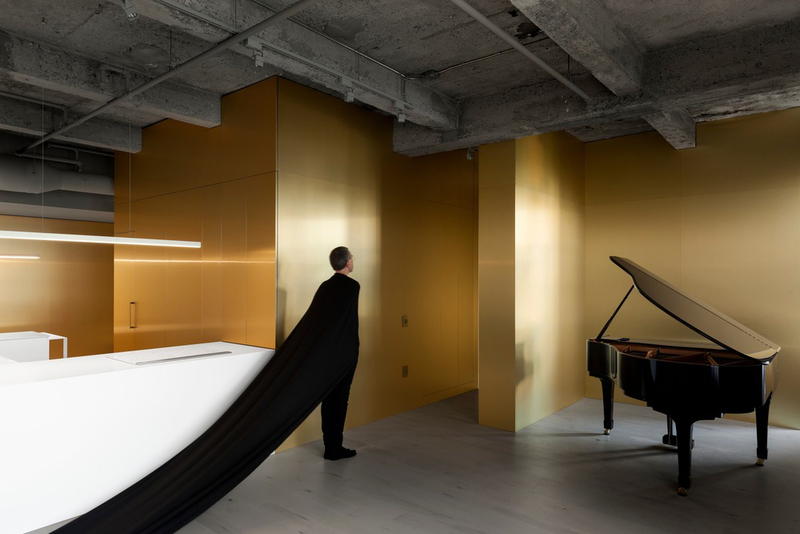 Yes it’s hard to know what to think about this project, designed by Jean Verville Architecte in Montreal, Canada… is it an art installation? Or an architectural design? Or a theatrical, photo shoot? 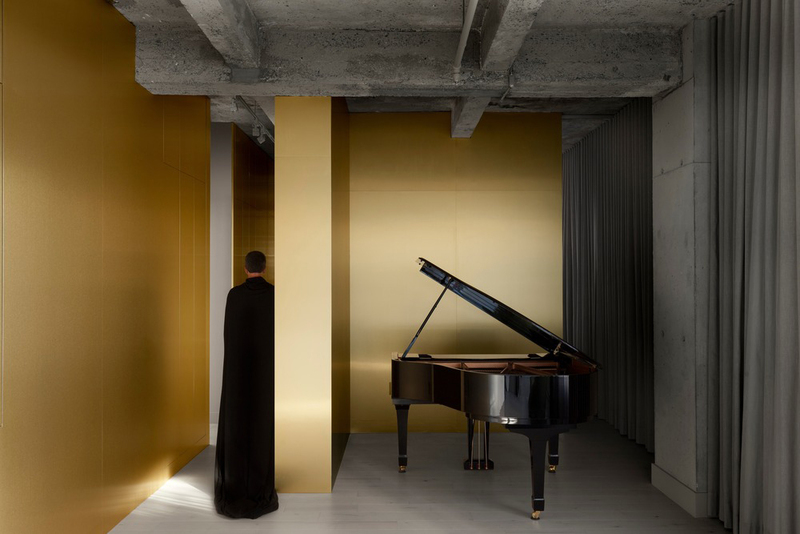 There’s something about the glossy, black grand piano sitting alone in a room, sheathed in gold, that makes you wonder is it a film set? Or a set up? 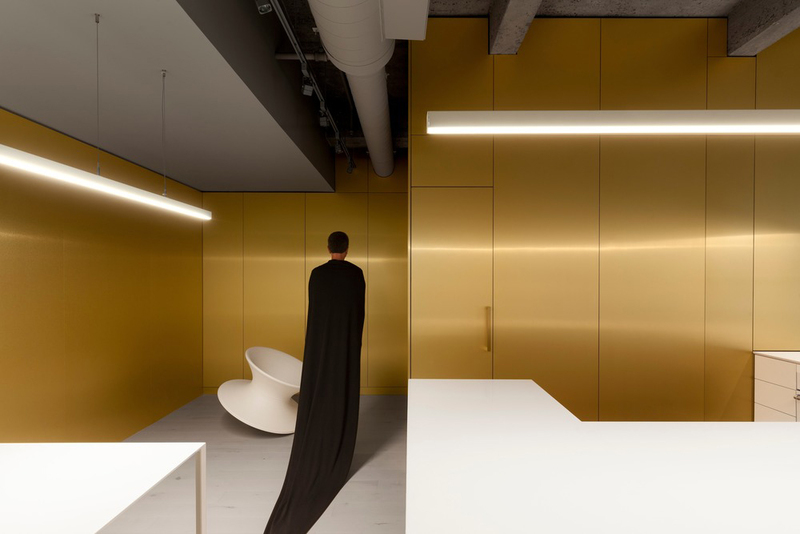 Is the black-cloaked figure roaming the corridors part of the language of the space or is he a decoy, making you forget which cup the ball has been hidden under? Is he the magician that allows you to take a kitchen and make it read more like a receptionist desk at an avant-garde New York gallery? 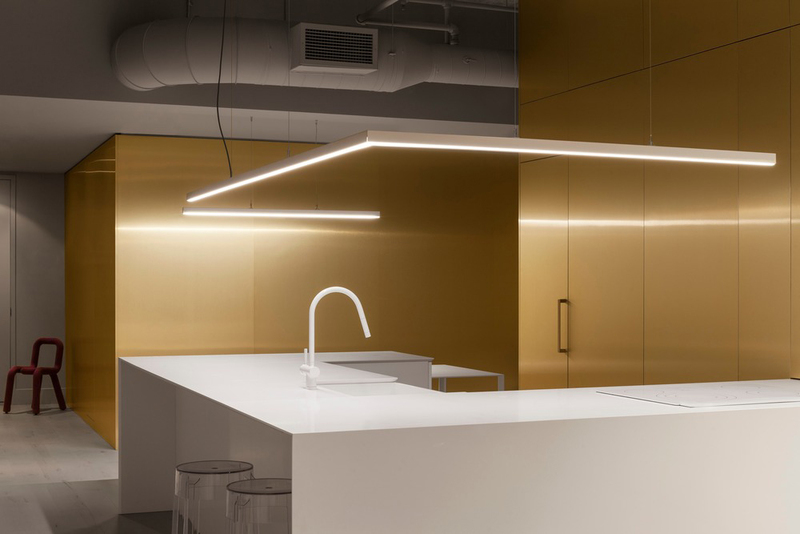 The kitchen with its surgically precise clean lines and hard fluorescent, L-shaped lighting glowing like a hospital-grade surgical lamp. 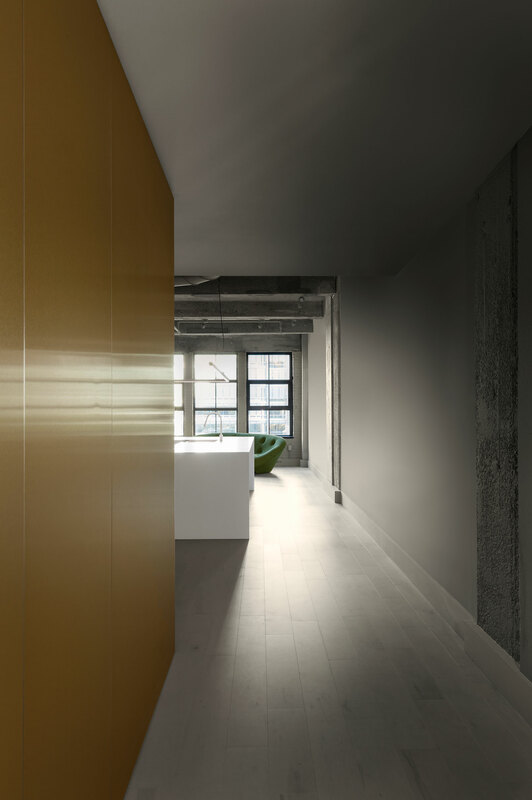 Related Post: Stories On Design // Metallic Interiors. It all feels very Space Odyssey meets A Clockwork Orange. 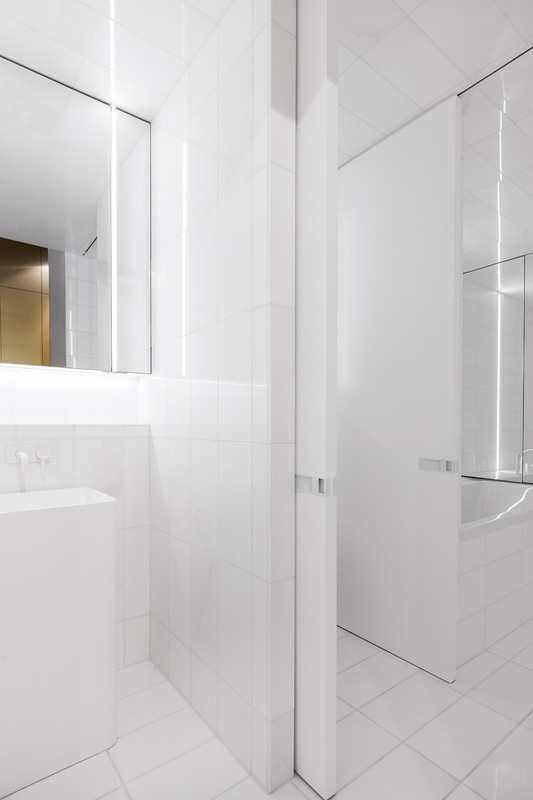 White bathrooms so white they make your eyes hurt. The ruthlessness of the fluorescent tubes demanding and uncaring. 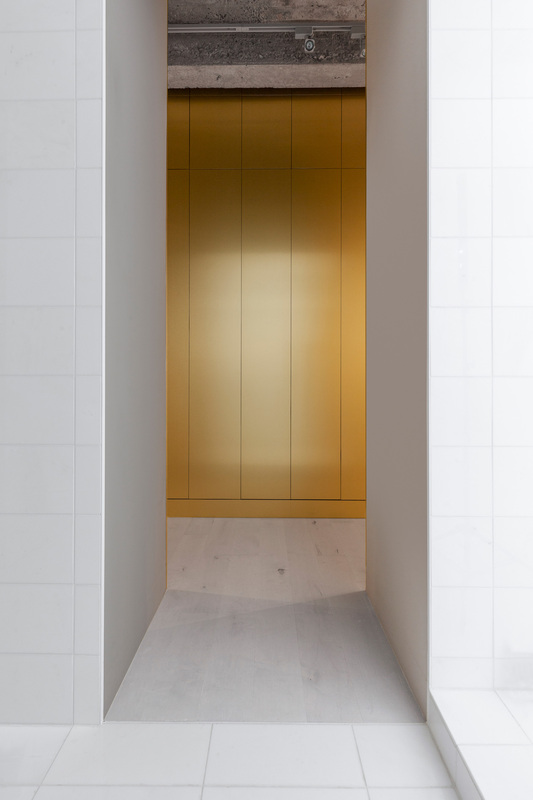 Only the glimpse of the golden wrapped walls in the mirror or through the open bathroom entry soften the unforgiving nature of the space. 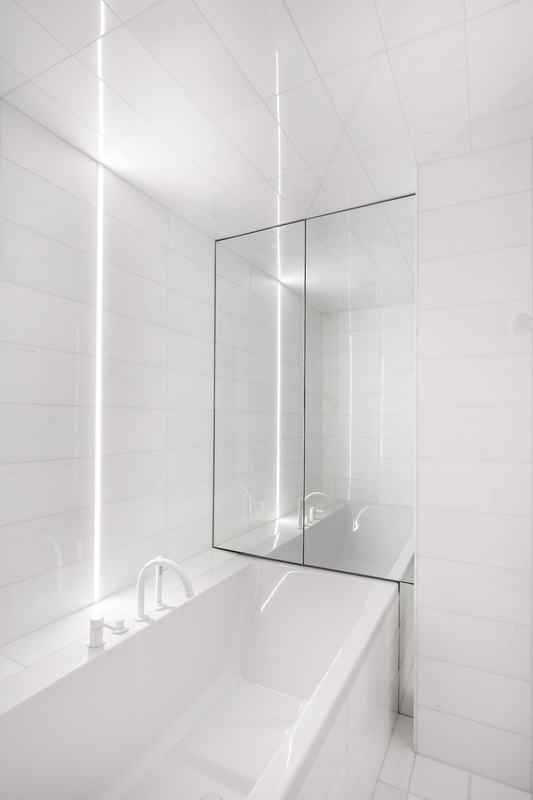 This is no typically domestic bathroom, it would be more at home in a sci-fi lab. Soft grey curtains fall in neat folds, next to the kitchen, disrupting yet again the senses. 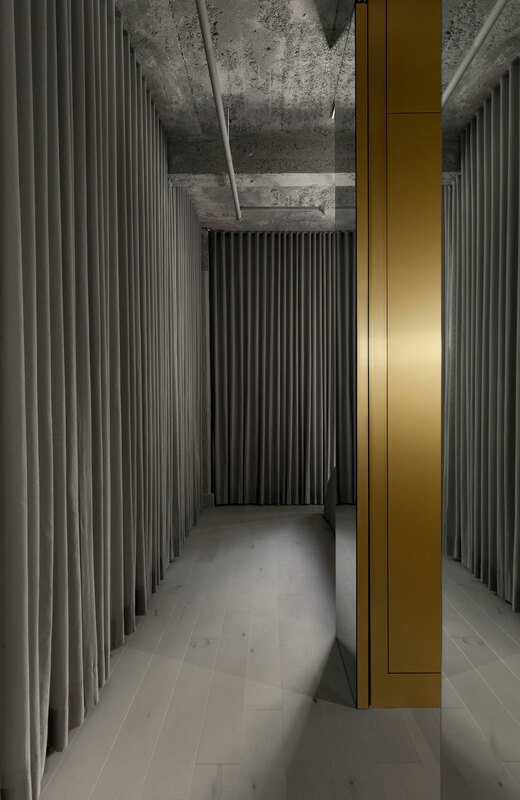 The softness of their decent into gentle pleats that brush the top of the polished wooden floors is reminiscent of pulled closed changing rooms of high end fashion houses, hiding behind them models putting on expensive dresses. Everything seems to hide something else. What does hide behind those heavy drapes? What do the high walls of gold contain? Where does the man disappear to once the sun rises again? But all this was entirely the point don’t you see? Verville wanted abstraction. He wanted to confuse. 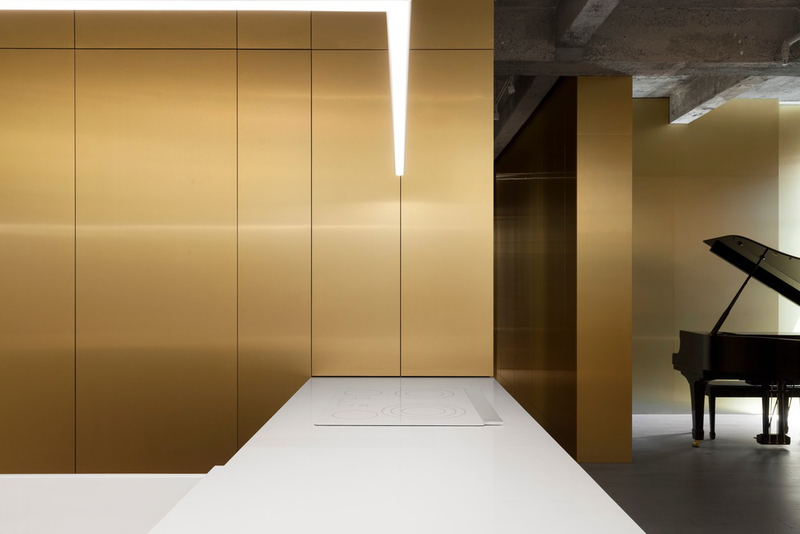 “Offering images evolving towards abstraction, this golden ribbon, containing domestic functions as storage units, breaks up space into a single operation of powerful efficiency,” said the architect. 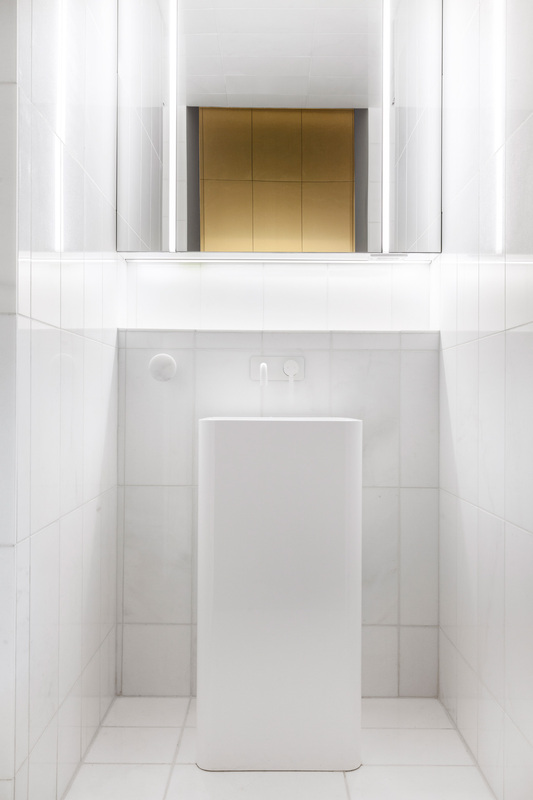 Jean Verville explores the nature of architecture and installation and scenography as part of his work. 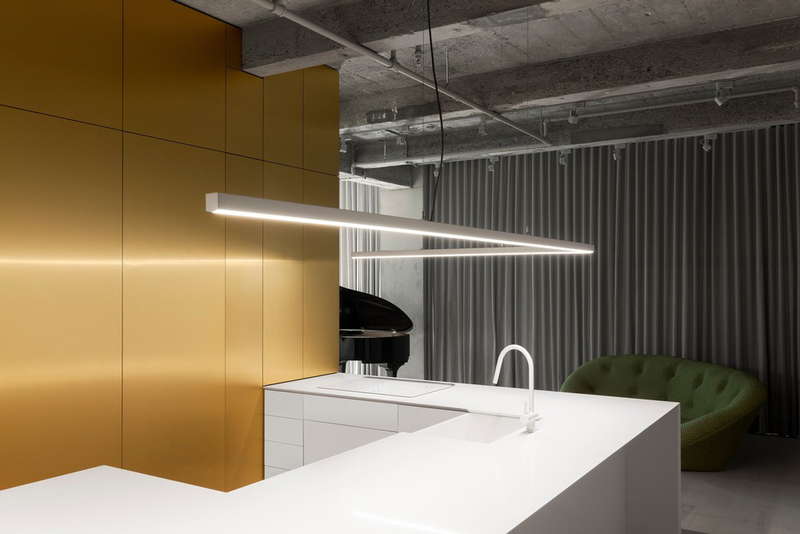 He actively explores the artistic experience within architecture. He wants to make you think. Even better, one suspects, if he leaves you confounded. 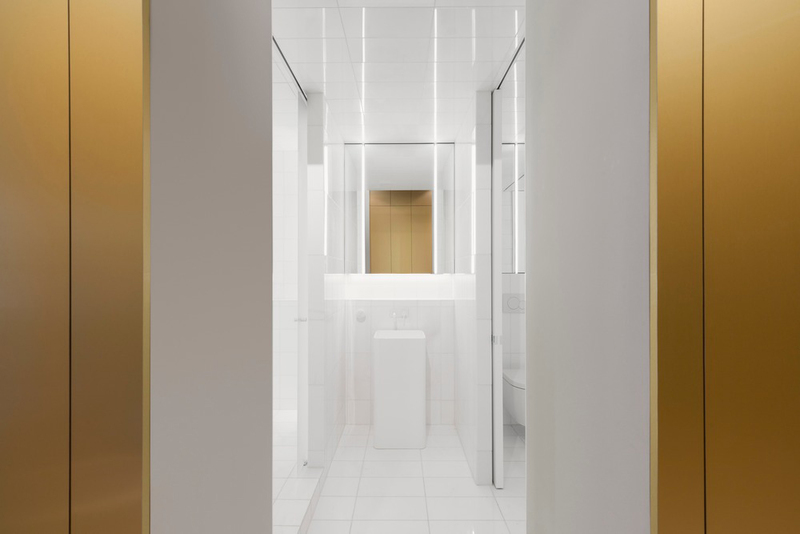 His interest lies in the possibilities of hybridisation between arts and architecture and their impact on the architectural creation process. 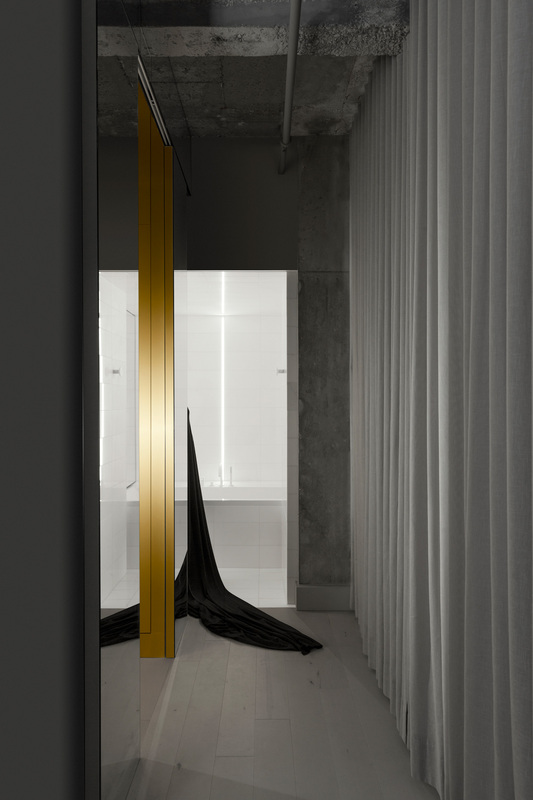 “The proposal calls for mechanisms of perception of space that break the usual patterns of domesticity. 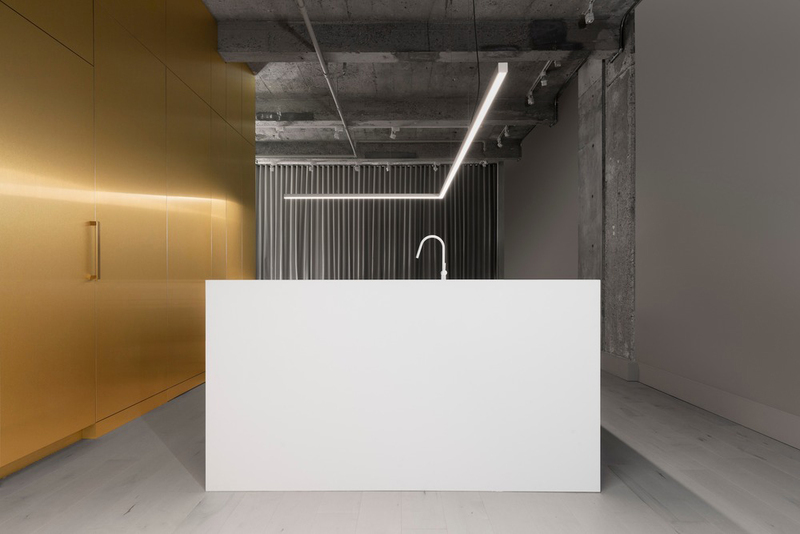 In order to satisfy the needs of everyday life, but also to subtract them from time to time in order to create a working environment that strengthens the maestro’s concentration, the bare space skilfully conceals functions in a succession of sculptural volumes,” said the architect. 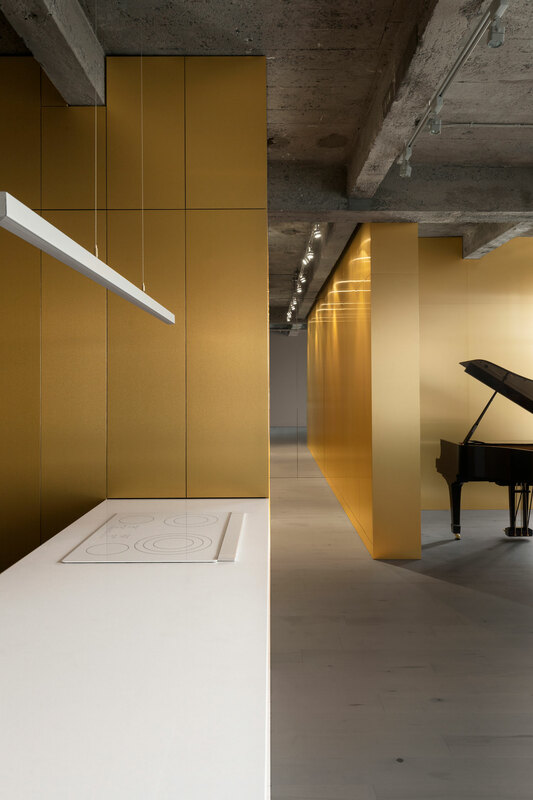 In 2017, architect Jean Verville realised IN 1, 2 and 3 – three installations combining art, architecture and domesticity. This project, IN 3, is an experimentation combining the same three disciplines. 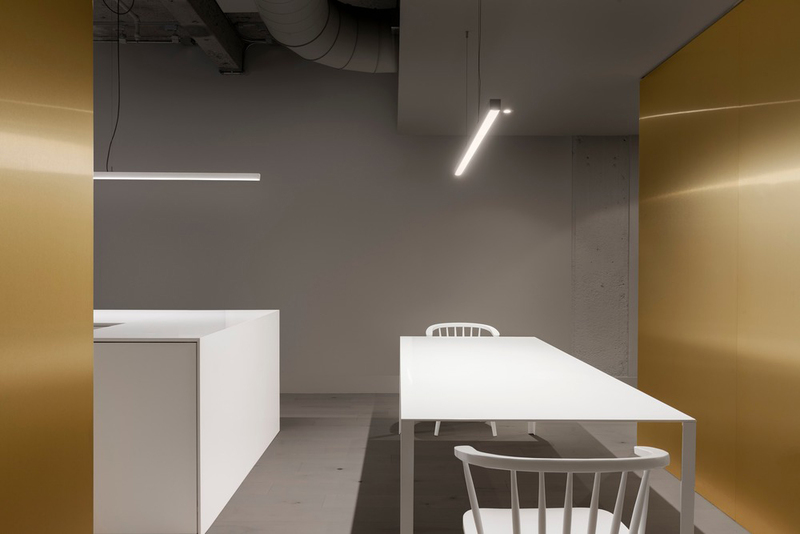 It is part installation, part photography and part design. But whatever you end up calling it, it represents an intimacy of the accumulative effects of bringing different disciplines together. 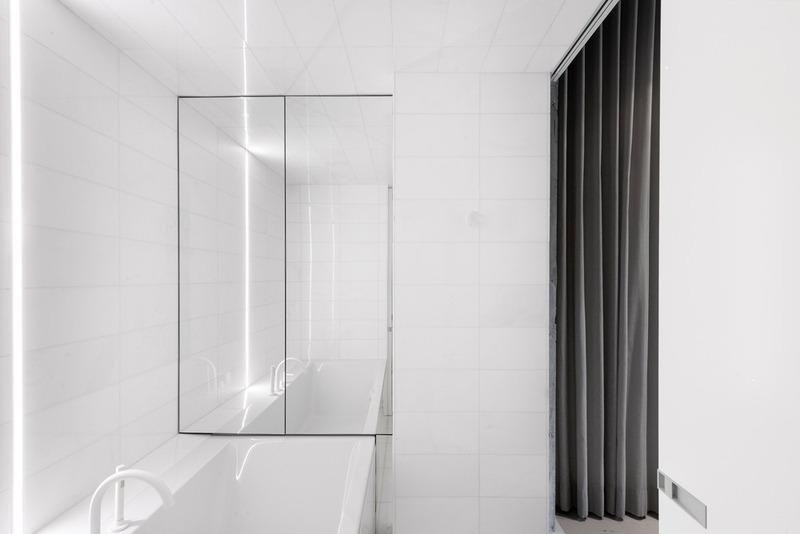 Jackalope Hotel in Mornington Peninsula by Carr Design Group.